The original village garage is situated on a 'T' junction opposite the village green of Brabourne Lees and has only had two owners since it was established in 1918. We still supply diesel and paraffin, using attended service, where our forecourt staff will also be happy to check your fluid levels and tyre pressures. Our forecourt shop sells lubricants, sprays and polishes and various accessories and spares for the home maintenance enthusiast. We carry out servicing, repairs and MOT's for all makes of car, we can also supply tyres, exhausts and batteries, in fact any part your vehicle might require. Should you have an accident we can supply and submit an estimate to your insurance company and even help you fill in your claim form. We carry the largest UK stock of new Perodua cars and a number of used cars. These are all held on our forecourt so can be easily seen without prior notice. All work is carried out by professional and friendly staff using the latest technology. If it's to do with cars, it's to do with us. 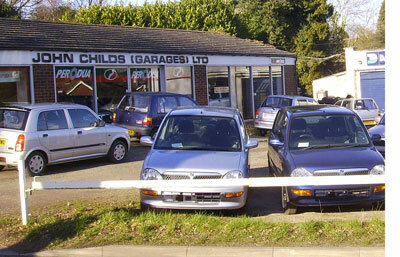 Perodua UK Limited holds the import and distribution franchise for Perodua vehicles manufactured in Malaysia. Perodua is the second largest car manufacturer in Malaysia and has chosen the UK as its gateway into Europe. John Childs Garages Ltd has been the top UK dealer for the past 8 years and the only Uk dealer to have been presented an award in Malaysia in recognition of customer service and performance. Perodua vehicles were launched in the UK during 1997 and are currently sold through a nationwide network of 65 dealerships. The compact and afforable Nippa five-door hatchback put the company on the map. In 2000 Perodua introduced the Kenari Mini-MPV to the UK market along with the Kelisa in February 2002 and the Myvi in October 2006. Significantly, Perodua has gone from strength to strength and continues to increase its market share. The vehicles main virtues are value for money, excellent reliability and build quality, plus the impressive standard equipment specification and latest generation technology apparent in models such as the Kenari and Kelisa are all major factors in the company's continuing success.